Although not intended for the development of policy, a recent modeling study carried out in Ontario illustrates the relationship between precursor emissions and ambient concentrations of particulate matter (PM). Atmospheric fine particulate matter is a complex phenomenon, because it may be emitted directly (primary PM), and is also formed by the reaction in the atmosphere of several precursor compounds, including SO2, NOx, VOC, and ammonia (secondary PM). As is the case for ozone, the possibility of disbenefits also exists, that is, increased PM concentration when emissions are decreased. A study was therefore carried out to provide a preliminary assessment of the sensitivity of PM concentrations to changes in emissions. The Models-3/CMAQ system was used with a domain that extended from northern Florida to Hudson Bay, and from west of Chicago to the Canadian Maritime Provinces. Two episodes were considered in this study: one in July 1995 and the other in February 1998. Unlike the case of North American ozone, PM episodes can occur at any time of year. As discussed previously, the conclusions of this study apply rigorously only to these two episodes, but an effort was made to assess how representative the episodes were of high PM episodes in general. 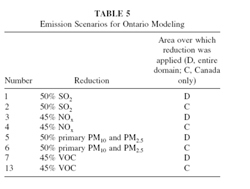 The emission scenarios considered are summarized in figure 7.6.2-1. The chemical composition of the particulate matter is different between the winter and summer episodes, being high in nitrate in the former and high in sulfate in the latter. This means that the precursor dependence is also different, so the two episodes are discussed separately (7.6.2-2). The impacts of the emission changes will differ in different regions of the modeling domain, depending on the spatial relationship between the area considered, the area in which the emissions are affected by the scenario, and the meteorological conditions, especially wind direction. The discussion that follows therefore considers several subdomains, as defined in 7.6.2-2. For this summer episode where the days with high modeled PM2.5 were usually dominated by sulfate concentrations, reducing SO2 by 50% across the domain resulted in 36 to 45% reductions in sulfate, accompanied by small reductions in ammonium and increases in nitrate concentrations. PM2.5 reductions were 10 to 32%. Reducing SO2 by 50% in Canada only resulted in 1 to 15% reductions in sulfate for the subregions analyzed. The larger improvements were in subregions 4 and 7, which are downwind of the major urban and industrial centers of Ontario. Reductions in ammonium and increases in nitrate concentrations again occurred. The net changes in PM2.5 were reductions of up to 5%. Reducing NOx by 45% across the domain resulted in small reductions in sulfate for the subregions analyzed. The reductions in nitrate were 26 to 46%, with net reductions in PM2.5 of 4 to 10%. The response to a 45% reduction in Canadian NOx emissions was largest in subregions 3, 4, and 7. For these three regions reductions in nitrate concentrations were in the 20 to 40% range, with corresponding reductions in PM2.5 in the 1 to 6% range. Reducing VOC emissions by 45% domain wide resulted in modeled reductions of nonbiogenic secondary organic aerosols (SOA) of about 40 to 45%. The net changes in modelled PM2.5 were reductions of 1 to 3%. Reducing Canadian VOC emissions by 45% resulted in modelled reductions of nonbiogenic SOA ranging from about 2% in southwestern Ontario to 18% in subregion 7. The net changes in modeled PM2.5 were reductions of 0 to 3%. Reducing primary PM emissions by 50% domain wide resulted in modeled reductions in primary PM concentrations for all size ranges of 50% in all subregions. The net changes in modeled total PM2.5, that is, primary plus secondary, were reductions of 7 to 19%. 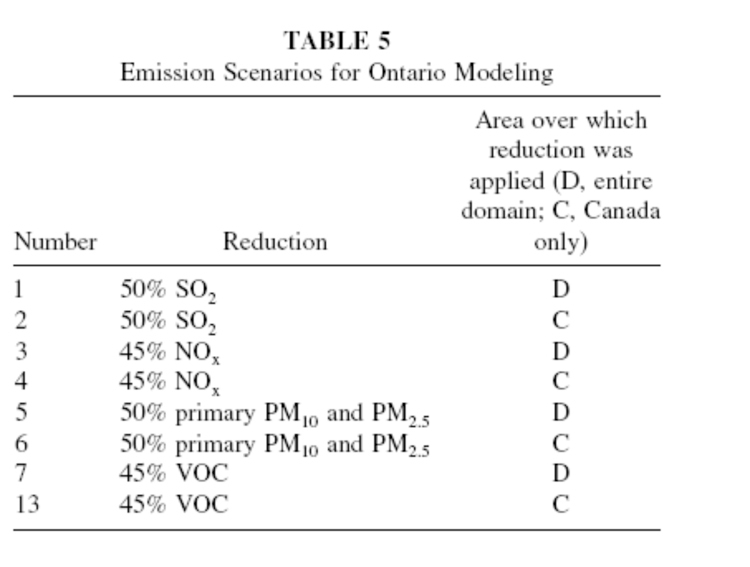 Reducing Canadian primary PM emissions by 50% resulted in modeled reductions in primary PM2.5 concentrations of about 10% in southwestern Ontario and 25 to 40% in subregions 3, 4, and 7. For the winter episode where the days with high modeled PM2.5 were usually dominated by ammonium nitrate concentrations, reducing SO2 by 50% across the domain resulted in 15 to 33% reductions in sulfate for the subregions analyzed. There were small increases in nitrate concentrations and decreases in ammonium concentrations, with net reductions in PM2.5 of 1 to 2%. Reducing SO2 by 50% for Canada only resulted in 5 to 15% reductions in sulfate for all subregions except region 10 (New York) where the reductions were smaller. Accompanying changes in nitrate and PM2.5 were 1% or less. Reducing NOx by 45% across the domain resulted in 6 to 32% reductions in nitrate. There were significant percentage increases in sulfate concentration, but the absolute changes were small. The net changes in PM2.5 were reductions of 4 to 17% (but the reduction in subregion 7 was much smaller at 0.4%). Reducing NOx by 45% in Canada resulted in 4 to 29% reductions in nitrate, again with increases in sulfate concentrations, of about 5 to 20%. The net changes in PM2.5 were reductions of 2 to 14%. Reducing VOC emissions by 45% domain-wide resulted in modeled reductions of nonbiogenic SOA of about 50 to 55%. Because of the small contribution of SOA to total modeled PM2.5, reductions were limited to 2 to 8%. Reducing Canadian VOC emissions by 45% resulted in modeled reductions of nonbiogenic SOA ranging from 30 to 44%. The net changes in modeled PM2.5 were again small, with reductions of 1 to 6%. Overall, the largest reductions in PM2.5 in summertime were achieved by domain-wide reductions in sulfur dioxide emissions. Wintertime PM2.5 is dominated by nitrate, and thus responds better to reductions in NOx emissions. The sensitivity of predicted PM concentrations to variation in ammonia emissions was also studied. This was necessary, not because control of ammonia emissions is anticipated, but because there are substantial uncertainties associated with the current ammonia inventory. Although the absolute PM mass predicted by the model is affected by the reduction in ammonia imposed in this sensitivity test, it is important to note that the percentage response to the emission reduction scenarios is very similar for the summer time episode. This lack of sensitivity of the response to absolute ammonia emissions gives enhanced confidence in the sensitivities to precursor emissions for the summer. There is somewhat greater variation with ammonia emissions in the winter time, with lower ammonia emissions being associated with lower reductions in PM concentrations when the precursor emissions are reduced. Improvement in the quality of the ammonia emission inventory is clearly required.